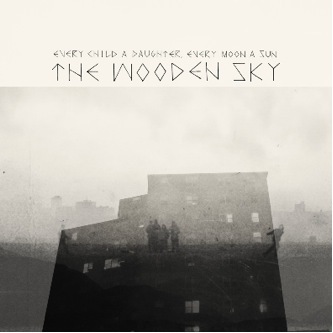 The Wooden Sky’s third studio album, Every Child A Daughter, Every Moon A Sun, is every bit as creative as the albums name. This third album has a different feel than a traditional country album. Between the simplicity and experimental sounds, The Wooden Sky really pushes the country/folk genre to new limits, making for a good album to relax to. For the most part, The Wooden Sky created an album that was simple to the sound, but intricate nonetheless. The drumming is very direct and doesn’t seem to be much more than a beat-keeping mechanism, which works well with this style. The guitar is also simple, and sometimes non-existent. Not to take away from the talent, for the album is very voice-dominated. The vocals by Gavin Gardiner are very “country” and almost soothing. Be careful listening to this album late at night, because you may get swooned to sleep. His vocals seem to be repetitive at times, but overall they are excellent vocals. The Wooden Sky’s experimental sounds are refreshing to hear, especially in a country album. It seems as though they recorded in different venues as the album rolls forth. The sounds create an eerie vibe at times, and energetic feel at others. All appropriate usage, and nothing that seems out of place here due to good producers and audio techs. Overall, this album is a good listen. For those that don’t particularly like country music, you may find the songs on this album to be good for homemade mixtapes to girlfriends. Those that are unlucky enough to plan weddings might find songs from this album good for receptions. Give it a listen and decide for yourself. I doubt you will be disappointed. Download The Wooden Sky’s single “Malibu Rum” HERE.